Now you can make a secure donation online to financially support Chippewa Area Keryx! Welcome to the Chippewa Area Keryx website! Keryx Prison Ministry made the news! ​Click the links below to view or download the video. ​ Continue to pray that the doors will be open in new facilities and that they remain open in the ones we are welcome in. Pray for laborers for the harvest. Pray for the Church behind the prison walls as they contend for the souls there and carry that great Light into the darkness to preach to the lost. God bless you and thank you for your continued support! Visit keryx.org to find out how you can get involved in other areas of the state, including Michigan Youth Challenge. As always, if you are have not served on a Keryx weekend, haven't served in a while or just want to make sure we know you want to serve, please send us a note with the form on the Contact page. Links to the prayer vigils on 3dayol.org can be found on the Prayer Vigils page. Sign up for one today! We remember our fellow Keryx soldiers who have gone before us on the In Remembrance page. Looking for Keryx in Community? 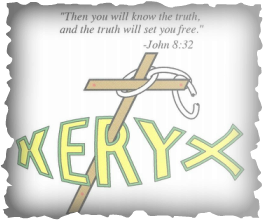 If you haven't heard, Keryx has a branch of ministry that conducts weekends outside the prison as well! If you would like to get involved, check out the website at keryxic.org.